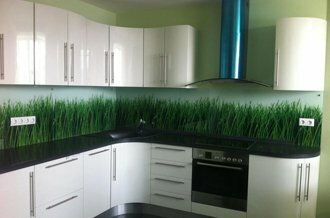 What glass is suitable for kitchen backsplash? - Tempered Glass Looking for Tempered Glass? What glass is suitable for kitchen backsplash? The specialists from Giovani Glass are disclosing some important secrets. As a rule, the glass thickness for a kitchen backsplash is 6 or 8 millimeters. Experts recommend using only tempered glass in the working area of ​​the kitchen. The main reasons for it - safety, durability and reliability. Tempered glass is 5 times stronger than usual one. But even if it breaks, its fragments will be small and not sharp. Such a backsplash is perfectly adjacent to the stove and is not afraid of exposure to heat. Plain glass is less reliable. 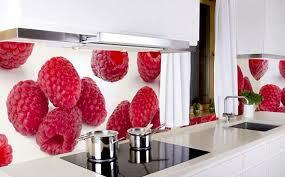 Plexiglass is generally difficult to be considered as an option to finish the walls in the kitchen. It cannot be used in the zone of a gas or electric stove due to temperature fluctuations, plexiglass is easily scratched, dims, grease and other kitchen contaminants are difficult to be cleaned from its surface. When choosing a glass for a backsplash you may need the so-called bleached glass - Optiwhite. Ordinary glass, although it seems to be absolutely transparent, actually has a pronounced greenish “bottle-like” shade. Tt will be invisible on a colored backsplash (with a landscape, a city panorama or a multi-colored still life). But greenish tint can ruin everything if your backsplash has a very light background. Experts note that due to greater transparency, Optiwhite makes the drawing on the backsplash clearer and brighter. But this type of glass is about 30% more expensive than usual one.